Conceived by former Aston Martin CEO Victor Gauntlett and the brothers Giani and Ellio Zagato, the V8 Vantage Zagato, entered production in 1986. Limited to 50 production cars. By 1988 all 50 had been completed and delivered to their lucky owners. 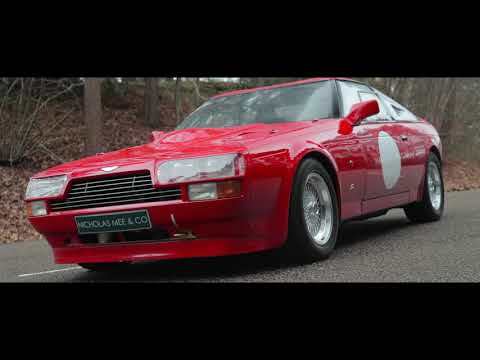 Chassis: 20013, the first production right hand drive car, was delivered new to its first owner in 1986 before being acquired in 1998 by English actor, comedian and screenwriter Rowan Atkinson, with the express purpose of presenting it to the Aston Martin Works for a comprehensive rebuild to road racing specifications. Following a re-engineering and rebuild programme, to AMOC racing regulations for road equipped cars, 20013 was campaigned at national level by Rowan Atkinson, with Works support and with varying success over 3 years, before being retired and sold on in 2004. A substantial Aston Martin file, of all the competition preparation on this unique car, including engine development, chassis, brakes and suspension works, weight saving and competition modifications, rebuilds and FIVA identity papers. 20013 remains to this day, the only V8 Vantage Zagato known to have been race prepared and supported by the Aston Martin Works, carrying fond memories for those involved. Purchased by the last owner in 2016, the car has been subject to further development and revisions, enabling the car to be enjoyed on the public roads. Retaining the works prepared 482 bhp fuel injected 5.3 litre engine, the car has been reinstated with refrigerated air conditioning, re-trimmed original Zagato seats, storage compartments, carpeting and interior appointments enabling the car to be both practical and comfortable. Without doubt the most significant and collectable of the 50 production V8 Vantage Zagatos constructed, 20013 can now be driven on the road in comfort, whilst benefitting from the enhanced power and ultimate chassis dynamics, of the track focused car. Currently UK registered & MOT’d.